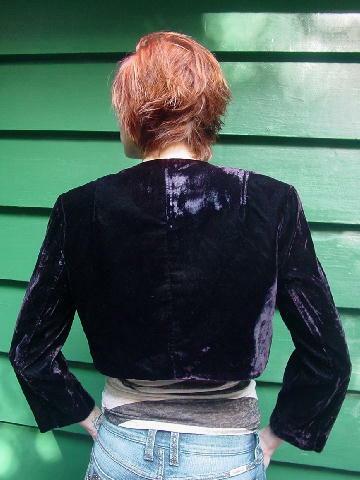 This 66% acetate and 34% nylon bolero style crushed black velvet (with eggplant-burgundy overtones when in the sun) evening jacket is by Scott McClintock Separates. It has shoulder pads, long sleeves, and the back and front (not the sleeves) have a black 100% acetate lining. 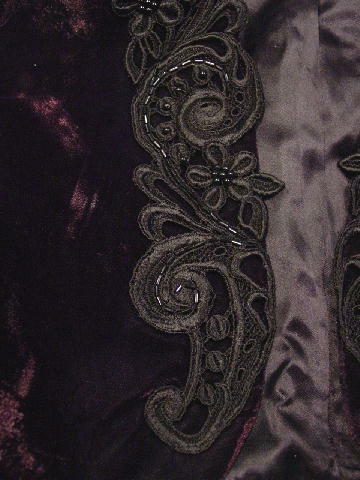 The front of both sides has a lighter black embroidered flower and vine design with black round and elongated beads. shoulder to shoulder 16 7/8"
shoulder pad to shoulder pad 17 7/8"
shoulder to hem 14 1/2"